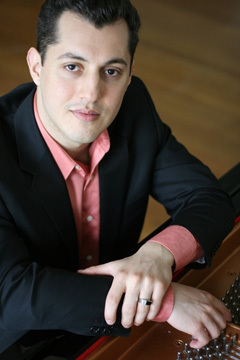 PARAMUS, NJ — Armenia Fund USA Eastern Region Affiliate is proud to announce the addition of the Armenian-American pianist and composer Karén Hakobyan as their new Cultural Program Advisor. Karén has become a prominent influence in the international musical scene since his Carnegie Hall debut at the age of seventeen. He is a top prizewinner of multiple international piano and composition competitions. He has received degrees from the Manhattan School of Music, Mannes College of Music, and the University of Utah. Karén has performed in major concert halls in Armenia, the United States, Mexico, Germany, France, Japan and Argentina. He has appeared as a soloist with orchestras across several continents. His performances have been broadcasted on WQXR New York's Classical Radio Station, WMFT Chicago’s Classical Radio Station, Argentine National Radio, Monterrey’s (Mexico) Op. 102 Radio Station, and Armenian National Radio. He is the Artistic Director of World Peace Sinfonietta, a New York based orchestra. (Visit www.karenhakobyan.com for more info). On May 6, 2016 Armenia Fund USA collaborated with Karen Hakobyan and the Armenian National Philharmonic Orchestra to present a concert dedicated to the Cultural and Diplomatic Relations of Armenia and Japan. The concert was held in Aram Khachaturian Concert Hall in Yerevan. It was well received and laid the groundwork for future cultural exchanges between the two countries. It was also the start of new beginnings between Karén and Armenia Fund USA. On May 24, 2016 Karén, along with the National Chamber Orchestra of Armenia, held a concert at the Armenian National Gallery to honor Hyebridge Telehealth Telemedicine Program, which is one of the Armenia Fund USA’s important projects since 2009. “Music has been my passion and purpose since my early childhood. Growing up in Armenia which has such a rich cultural and musical tradition was the perfect environment for a young aspiring musician. I was fortunate to study with some of the brightest minds in Armenia such as composers Edvard Mirzoyan and David Sakoyan among others. In 2001, I graduated from Tchaikovsky school, which had an enormous impact on my early development, and briefly attended the Komitas Conservatory before moving to the United States in 2002 at age of 16. I had always followed Armenia Fund's caring involvement in the community but it wasn't until about a year ago when I established a personal connection by meeting with Lisa Stepanian to discuss the Tchaikovsky Music School Reconstruction project. Being an Alumnus of Tchaikovsky, I knew exactly how much it was in a need of a major reconstruction and could fully appreciate the impact such a project would have on the development of the future generations of students.